Hey friends....playing along today at Simon Says Stamp. It is their 4th birthday and they are looking for cards to celebrate their toddler years. Card base is SSS Ultra Thick 120lb card stock (my favorite by far!!). Layered that with Chocolate brown card stock cut the same size. I made a "mask" of the number 4's, then sponged with ink. The Viewmaster Reel is cut with Silhouette Cameo and the picture of Simon is from a post card included with my last order from them. The super cute button is from Bossy Joscie Crafty Flair. Well, isn't this just adorable! Very cute card and thanks for the extra little Simon tribute! 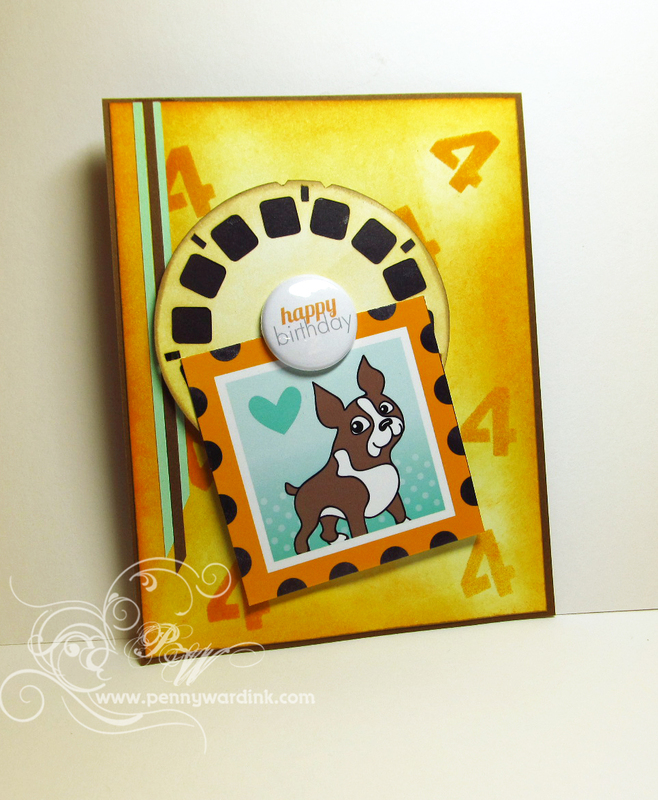 :) Thanks so much for playing along with us over at the Simon Says Stamp Challenge Blog! Hi I'm Penny! I am a Daughter, Sister, Wife, Mom, Nana, Breast Cancer Survivor and Crafter. Everyone has a story to tell, I share mine with paper, glue, fabric & thread. © 2018 Penny Ward INK. Felicity Template designed by Georgia Lou Studios All rights reserved.